1. History: this section recounts the history of God's promises and the response of God's people through Israel's re-establishment in Jerusalem after their exile in Babylon (c. 440 BC). Genesis ("beginnings")- God makes promises to His creation to overcome the destructiveness of our sin. This is expressed pivotally in the promise to become a "blessing to all nations" (12:3). These covenant-promises are given to Noah, Abraham, Isaac and Jacob, their children and all who believe. Exodus ("the way out") - God uses Moses to miraculously take a slave-people out of Egypt and gives them a unique identity as His people by giving them His laws to guide the relationship, including the Ten Commandments, and a portable "tabernacle" for worship as His people traveled through the desert. Leviticus ("He called") - God calls this people to holiness, i.e. to be like Him in purity. This handbook enabling His people to respond, provides details of the provision of sacrifices and related practices, both to deal with human sin against God's holiness and uncleanness standing in the way of health and wholeness. Numbers ("census of the tribes") - God guides and provides for His people through the wilderness from Egypt to the promised land of Canaan. The journey is extended 40 years due to Israel's distrust in God. Deuteronomy ("second expression of God's covenant") - Before Israel enters the promised land, Moses reminds them of God's covenant promises and challenges them to faithfulness in the challenges which lie ahead. Joshua ("Yahweh is salvation") - Following the death of Moses, Joshua leads Israel in its conquest of Canaan. While God called Israel to holiness, Israel allowed the Canaanites to corrupt them with their practices of prostitution, infant sacrifice and religious syncretism. Judges - For many years Israel was overcome by the Canaanites, both militarily and morally. Periodically in this low ebb "judges" arose to call Israel back to it's calling to holiness (i.e. moral separation from the practices of the surrounding nations) and to shake off Canaanite oppression. Ruth - On the surface Ruth is a beautiful romance of a Gentile woman marrying into the bloodline of Jesus Christ. It provides a glimpse into the lives of ordinary godly people during the turbulent period of the Judges. The story foreshadows also a greater kinsman-redeemer, revealed in the NT, willing to purchase a forfeited inheritance. 1 Samuel - Samuel, the last of the "judges" in this dark period, was also a prophet calling God's people back to true worship of Yahweh (Exodus 3). Samuel anointed Saul to be Israel's first king. When Saul fails in his obedience to God, Samuel anoints David. 2 Samuel - David is a good king, in fact Israel's best, ushering a golden age of strength and unity. Despite his sin, David keeps his eyes and heart on right relationship with God. His son Absalom however revolts against his father and temporarily takes control. 2 Kings - The divided kingdom was ruled by many kings. The general trend however was religious syncretism and moral decay, despite a series of righteousness prophets who were generally rejected. The northern kingdom (Israel) was taken captive by the Assyrians and later the southern kingdom (Judah) by the Babylonians. I & 2 Chronicles ("the affairs of the day") - The next two books are a review of the history of God's people emphasizing the importance of spiritual purity and devotion to God, avoiding syncretism with the surrounding nations, the critical lesson Israel had ignored, leading to the destruction of the Temple and it's painful exile in Babylon. Ezra - Cyrus, who conquered Babylon in 539 BC, gives Israel freedom to return to Jerusalem. Ezra leads a remnant of those who return to rebuild the 700pxtemple under challenging circumstances. Nehemiah - Nehemiah leaves Persia for Jerusalem 14 years after Ezra and carries on the work with primary focus on rebuilding the walls of Jerusalem, renewing Israel's commitment to God's covenant and initiating related reforms. Esther - is a story of a Jewish woman in the royal court set during Israel's exile in Persia. Her experience illustrates the importance of trusting God, while remaining faithful to her identity and people, rather than be absorbed into Persian culture. Job - is believed to be the oldest book in the Old Testament wresting with one of the oldest questions of humanity, "why do bad things happen to good people?" Job's well-meaning friends join him to help answer the question. Job complains to them and to God about his misfortune but ends in silence. Psalms - contains 150 songs, prayers, laments and praises of King David and other Hebrew poets in five sections (Psalms 1-41, 42-72, 73-89, 90-106, 107-150. These expressions include the full range of human emotions in great honesty reflecting the yearnings and experiences of God's people. Ecclesiastes - Reflections from King Solomon: life appears meaningless with its seemingly aimless cycles and inexplicable paradoxes but is to be enjoyed to its fullest as a gift from God. The wise person will live life in obedience to God, recognizing God will eventually judge all persons. 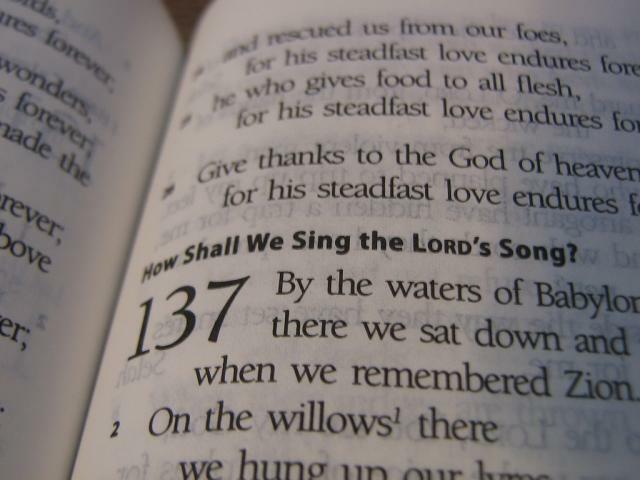 Song of Songs - is a lyric poem in dialogue form describing Solomon's love for his bride, a Shulammite girl. The joys of love in courtship and marriage counteract both the extremes of asceticism and lust. 3. Prophets: this section reflects the strenuous efforts of Israel's prophets to convince her to be true to God's covenant and, when Israel was punished for her rejection of God with exile, their vision of God's grace in the future. Isaiah - spoke into historical circumstances of Israel (c. 740-680 BC), warning of the consequences of their rejection of Yahweh, and lived to see the fall of Israel. Isaiah spoke also of the coming Savior and King of Israel after the exile. Jeremiah ("the Lord establishes") - is sometimes called "the weeping (or lonely) prophet" as he spoke (c. 627-585 BC) both to the Jews in Judea - who rejected his message with opposition, beatings, and imprisonment - and afterwards in their predicted captivity and exile. Lamentations ("to cry aloud") - Consists of Jeremiah's five melancholy poems of mourning over the utter destruction of Jerusalem and the Temple by the Babylonians in 586-585 BC. In the midst of these poems in "limping meter" (a cadence used in funeral dirges, Jeremiah yet speaks hope: Lam. 3:19-42. Ezekiel ("God strengthens") - Ezekiel's call was to keep before the Jewish exiles in Babylon the sins that had brought God's judgment on them (chapters 1-24) and to assure them of God's future blessing in keeping with His covenant to Abraham (chapters 33-48). Daniel ("God is my judge") - recounts events in the lives of Daniel and his three friends while in exile in the court of of their captors, faithful under pressure, interpreting the dreams of King Nebuchadnezzar of Babylon. Hosea ("salvation") - Hosea's wife, found to be unfaithful, was nevertheless persistently loved by Hosea and reconciliation eventually ensued. Theme: God's steadfast love for Israel in spite of her persistent unfaithfulness will prevail. Joel ("Yahweh is God") - A severe drought and invasion of locusts was a judgment on Israel's decision against God and a picture of a greater judgment through an army of human soldiers as devastating as locusts. Yet, by His grace, God would yet pour out His Spirit upon those who call on Him (Joel 3:28ff. Amos - Amos was a shepherd who vigorously attacked the social evils of his people as well as their syncretistic paganised worship and issued urgent calls to repentance as the only escape from imminent judgment. Obadiah ("servant of the Lord") - The descendants of Esau (Genesis 36) were in frequent conflict with the descendants of his brother Jacob. Now when Nebuchadnezzar of Babylon conquers Judah, the Edomites rejoiced and Obadiah responded. Jonah ("dove") - The Assyrians were cruel even by ancient standard. Jonah was called "the reluctant prophet" because, when sent to Nineveh (their capital from 700 BC) to proclaim the invitation to receive Yahweh's grace extended to them, he didn't go. Micah ("who is like Yahweh") - As peasants and villagers endured harassment from enemy armies, exploitation by wealthy landowners and oppression from false prophets and their rulers, Micah called for a return to God's covenant "doing justice, loving kindness and walking humbly with God." Nahum ("consolation") - One hundred years after Nineveh responded positively to Jonah's invitation to receive God's mercy, it's people returned to their old ways. Nahum spoke of the majesty and judgment of God and warned Nineveh of their coming destruction (which took place 612 BC) should they persist. Habakkuk ("embracer) - Habakkuk, like Job, struggled with the problem of evil, specifically why God allowed nations more wicked than Israel to punish her rejection of God's covenant. Like Job, Habakkuk concludes that though he doesn't fully understand God, he will trust Him (Hab. 3:17-18). Zephaniah - great-grandson of King Hezekiah, Zephaniah helped prepare Judah for its (short-lived) reforms which took place under Josiah (one of its all too few good kings). Though Zephaniah's primary messages were of warning, he expressed a clear vision of God's blessings to the remnant of God's people who respond. Haggai ("my feast") - Haggai was the first prophetic voice to be heard after the Babylonian exile. He called to people to rebuild the temple, which completion had been delayed 15 years and was in danger of being entirely ignored while the returning remnant focused instead on their own interests. Zechariah ("Yahweh remembers") - Zechariah was a grandson of a priest who returned from Babylon, a contemporary of Haggai and also called for the completion of the temple. In the 2nd half of the book Zechariah predicted more about the coming Messiah than any prophet except Isaiah. Malachi ("my messenger") - used a 'question and answer' (23 questions) method to challenge the people and priests who had become, 100 years after their return from Babylon, lax and mechanical in worship, without understanding what God desired.